I was a sophomore in college. When I had enrolled in college, my mother was absolutely certain that console games would be the death of my higher education, and so she decreed that I would not bring my Nintendo systems with me to the dorm. This edict, it turned out, was a phenomenally bad idea. Video games were my primary outlet for tension, and the biggest way to engage my imagination. Games were important to me; they were a part of me. Even without games on hand, their presence in my mind was undeniable. For example, I wrote an essay on games that first year that received the highest grade of any essay in my Japanese culture course. That, however, is another story. What matters now is that the first years of college were a pivotal turning point of my life, and without my favorite escape, the stress began to get to me. I was attempting to learn Japanese at the same time, and my performance in the course was less than exemplary (今は信じられないけどね). I was learning new things about myself that were difficult to accept. Amidst all the chaos, I wanted games to play, and the little offerings that were available on the Internet simply didn't cut it. Now that I think about it, it's a testament to my upbringing (and probably my arrow-straight personality) that I didn't turn to drugs or alcohol. Somehow, I survived, and life continued into Sophomore year. I was involved in a number of extracurricular activities, but life in my dorm room was horrid. I wanted an escape, something that I could do to relax. Near the end of that second year, one of the graduating seniors in my House posted an ad on a mailing list: a Sega Dreamcast, complete with two controllers and a VMU memory for data backup, along with Sonic Adventure, for $40. It didn't require much thought on my part. I answered the ad right away. I had played the Dreamcast before, and though it was competition for Nintendo, I respected the system greatly. Besides, now that Sega was out of the console business, the company was no longer competition, now, was it? I was curious about Sonic Adventure, but not enthused. I had not given much thought to Sonic in years, and, in fact, thought that my years as a Sonic fan were over. I had read somewhere several years ago that Sonic's experiment with 3D had been a dismal failure, and had ceased to follow the franchise shortly thereafter. Still, terrible or no, the game was a Sonic title; it might be fun to see what had happened to the character over the years. Little did I realize that the review I had read had been referring to the bizarre but tepid isometric Genesis title, Sonic 3D Blast. 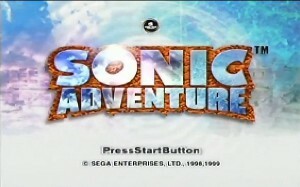 Thinking that it and Sonic Adventure were one and the same, I plugged the Dreamcast in and loaded up the game. The game was loaded with impact right from the very beginning. The opening movie is an apocalypse in motion: an entire city being destroyed by an explosion of water. Then, the water begins to take a vague shape, and a giant opens right in the middle of the thing—and a little strain of English, "Open Your Heart", makes it through the chaos of the soundscape. A moment later, the hard rock starts. This was not the bright, cheery Sonic world that had been on the Sega Genesis. This game had an edge. The game definitely looked pretty. The characters, redesigned by 上川　祐司 (Yuji Uekawa) had a new appeal and confidence all their own. Sonic sported long spines and piercing green eyes; Tails was a bit more confident and athletic and yet was still a cute blue-eyed boy, and Dr. Robotnik, was now sleeker and more devious-looking than ever. Dr. Robotnik now also went by the moniker of Eggman, which had always been his official name in Japan. Though the graphics caught my eye almost immediately, the other thing that caught my attention was the music. Created by 瀬上　純 (Jun Senoue), Sonic's world was full of melody, from the upbeat city theme in Station Square to the peaceful rhythms of Mystic Ruins. Even more than that, there were vocal songs. English vocal songs. GOOD English vocal songs. Jun Senoe (an exceptionally talented guitarist as well as a composer) and vocalist Johnny Gioeli would soon team up to make their own band, Crush 40, which would headline many future Sonic titles. So, yes, I loved the music. While music is usually what clinches a game for me, however, it was only part of a phenomenal mix this time around. Sonic looked GOOD in three dimensions. The worlds were laid out extremely well. 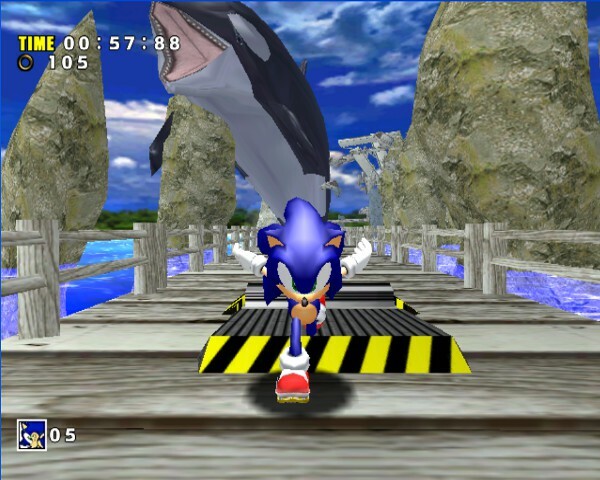 Sonic's control was tight and responsive, though occasionally a bit buggy. The action was fun and flashy. And then there was the story. A fully-voiced story, at that. With language options. I, having struggled dismally the previous year with Japanese, saw the opportunity to refresh my ears and set the language option to 日本語. I was happy to find that the Japanese voice acting was excellent. Sonic Adventure features six playable characters. SIX. Each character, once unlocked, plays an important role in the main story. Unlike many games in which each character's plot plays out in sequence, is not contemporary with the other characters' storylines, or simply is a kind of alternate reality, each character in Sonic Adventure is running about the world at the same time in the same story. Choosing to play as a character means seeing the events in the story from that character's viewpoint. The storytelling device was brilliant. Certain plot points that were a complete mystery to Sonic would be fully explained by playing as Knuckles. When Amy Rose, Sonic's obnoxious self-proclaimed girlfriend, prevents Sonic from destroying a certain robot, her motives are opaque until one plays through the story from her point of view. Not only that, but the characters have their own unique take on stages, as well. Unlike other games (even later Sonic games!) in which different characters have completely different stages or play through exactly the same stages with just subtle gameplay differences, Sonic and his companions go through exactly the same environments in drastically different ways. While most of the stages are built with Sonic in mind, a certain part of each stage is opened up for another character to travel through in a completely different way. Most striking to me is the brilliant design for Knuckles's stages. While Sonic runs through levels with the sole objective of getting from beginning to end, Knuckles has to explore stages to find hidden shards of the shattered Master Emerald. 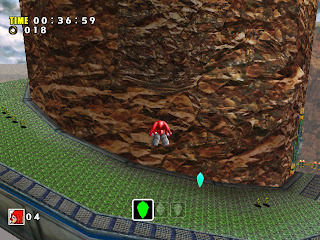 What is, for example, a linear race through mountaintops becomes, with almost no modification to the stage's architecture, an open stage for Knuckles to explore. Sometimes, I wonder how the designers did it. It couldn't have been easy, but it was spectacular. And, of course, there was Tails. Miles "Tails" Prower had his own take on the story. The little fox, separated from Sonic for parts of the story, learns to believe in his own abilities, eventually thwarting a threat to the city all on his own. 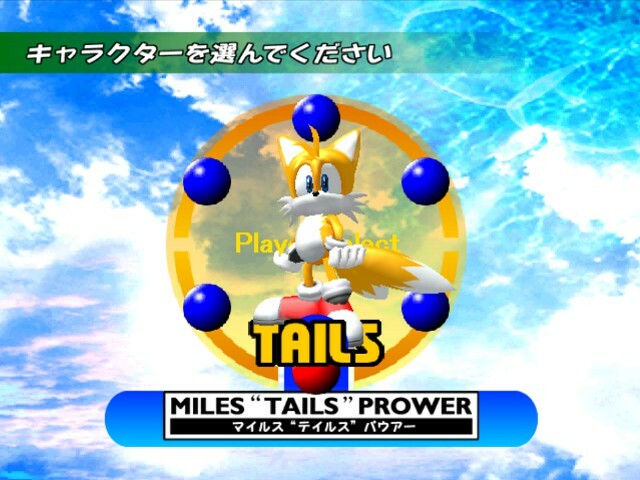 Tails's theme song, appropriately enough, is entitled "Believe in Myself." I played that game all through May and June. My dorm room gradually became brighter, the air became fresher and warmer, and by the time the year was up, I was a bigger Sonic fan than I had ever been before. Never before or since have I had such low expectations for a game, only to have them be so completely exceeded. When I went home that summer, I dug out an old copy of Next Generation magazine in which I vaguely remembered a review of Sonic Adventure appearing. Four stars. How had I missed that? Unfortunately, my abject admiration of Sonic Adventure was not shared by everyone. 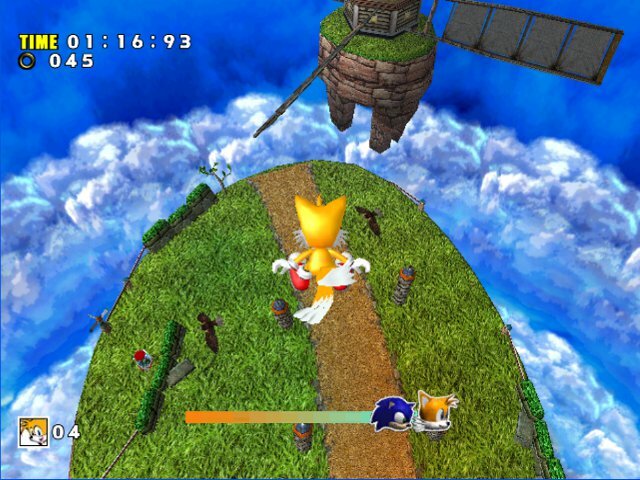 One of my favorite parts of the game was the Adventure Stages, the open worlds that connected the Action stages of the game. I loved exploring them, talking to the people and searching for secrets. Flying around the jungle with Tails quickly became my favorite way to relax after a day of classes. Unfortunately, I seemed to be in the minority: Adventure Stages did not appear in any subsequent game. The large cast of characters, too, has since been the subject of many complaints. I, for one, loved playing as Sonic, Tails, Knuckles, and E-102γ. Amy, I could take or leave. The bizarre fishing stages for the obese Big The Cat, however, I could easily have done without. And the Chao, a Tamagochi-esque artificial life system, was charming, yet extremely labor-intensive. For me, it was the best Sonic game I had ever played. For others, though, it was the beginning of the end of the world. I, blissfully unaware of the unrest that was brewing in the Sonic community, was still in Hedgehog heaven, however, and I was about to hit the most enjoyable gaming summer of my life.